This year the dash cam reached maturity, going from capturing weedy little videos of Russian car crashes to recording global news events. And these are the very craziest dash cam vids of 2013 from the whole world over. Yes, it's time for the 2013 Dashies. We've come a long way since the craziest dash cam videos of 2012, as you will see. We're going to go in somewhat chronological order, and we started off with perhaps the nuttiest video of all. A freaking meteorite blew into the ground near Chelyabinsk, Russia back in February, injuring over 100 people and blowing out windows across the city. In years gone by, this surprise crash-landing would have gone unrecorded. In 2013, it was all caught on dash cam. 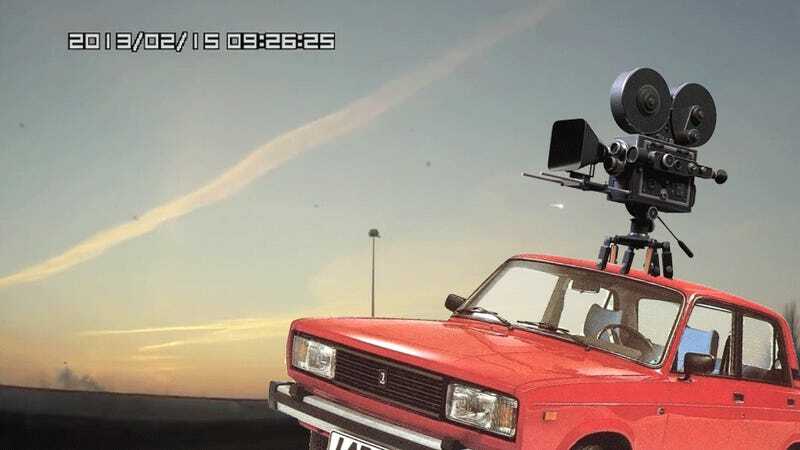 Since Russians have their dash cams always on to record potential highway robberies, insurance fraud crashes, or whatever else, they also record the sweeter things that happen on those free-for-all Eastern highways. This moron recorded himself shooting up to 120 mph in his Subaru. Unsurprisingly, he crashed right into stopped traffic. Alexei Volkov became known as "The Punisher" in Zelenograd after he started releasing dash cam videos of smashing all the cars that cut him off in traffic. He is a man standing up for the people, for public transportation, for Russia. Amazingly, no one was seriously injured when a tiny hatchback flew through the air and holy crap into the windshield of an oncoming family car in Taiwan. Final Destination is real, people. If you're wondering what it looks like to get hit by a landslide, this is it. And if you're wondering what the luckiest driver in the world looks like, just watch for the boulder coming from the top right of the video screen. If you're wondering what Michael Bay's dreams look like, this is it. Amazingly, nobody was hurt in this tanker truck explosion. The infamous NYC biker chase video ended up being more complicated than it first appeared. Range Rover driver Alexian Lien got surrounded by bikers in Manhattan trying to shut down a highway for stunts. Lien took off, ran over one biker (paralyzing him), then ended up in a madcap chase that ended with him getting beaten in front of his family by undercover cops. Eleven arrests later and it could not have been more bizarre. Nothing fills my heart with more joy than watching this angry Russian man get out of his car, grab the cell phone from someone who's just crashed their car, and smash it to the ground. A Russian driver could not help but crash into these two cows as they wandered onto the road mid-copulation. Again, neither man nor beast was seriously injured.